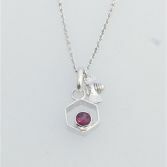 This pretty Hexagon Necklace with Gemstone and little Bee charm is handcrafted in sterling silver in my studio by me so is exclusive to JBJ. 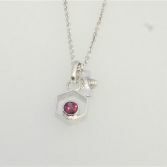 To add sparkle to the Hexagon necklace it has a stunning 5mm Rhodolite Garnet which a beautiful deep pink semi precious gemstone. The can be set with an alternative 5mm Gemstone please us the drop down option to select. 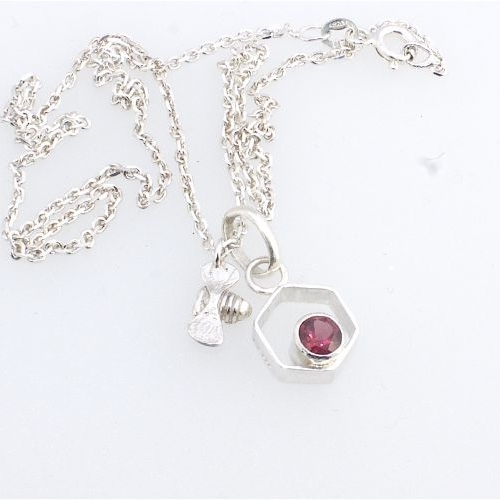 The Hexagon Necklace with Gemstone has full UK hallmarks stamped at an official UK Assay Office. 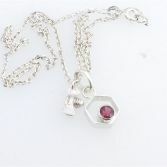 The Hexagon Necklace with Gemstone is hung on a contemporary diamond cut sterling silver Trace chain which is 16 inches but can be worn anywhere between 16'' or 18'' as it is supplied with a 2 inch extension chain. However if you would like a different chain please do message me julie@juliebrandonjewellery.co.uk. 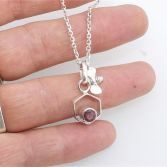 The Hexagon Necklace with Gemstone and little Bee Charm will be presented in one of my signature gift boxes and posted via Royal Mail 1st Class delivery (signed for) to any UK address free of charge.